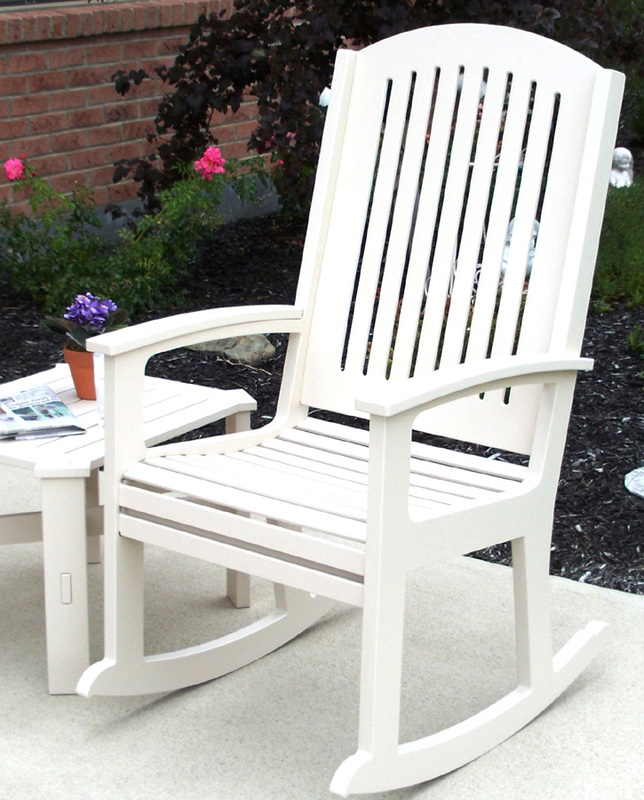 The most comfortable rocker on the market! The Forever Andure Flex High Back Rocking Chair is made of a super heavy titanium resin. It is a composition of an alloy of resin and titanium that is commercial grade heavy weight and very durable, it will not fade, break, crack, rust, rot, or chip. It is about the same weight as Teak, heavy so it will not blow away. It is perfect for all climates even coastal climates and can be left out all winter with out worry of damage from salt, freezing temperatures or the raging sun. The suns damaging rays will not fade or damage the furniture. The advanced composition of the titanium crystals reflects and redirects the suns harmful rays allowing generations of use. The Andure Flex High Back Rocking Chair has seats and backs of comfortable resilient parallel bars, thus the name Andure Flex. A hidden stainless steel core and bolt reinforce the joint of the seat and back legs. The arm chair has a flat gracefully curved arm to contribute to a crisp look. This product is shipped fully assembled. This furniture was designed for commercial use and is used at resorts, convention centers, and commercial buildings and at your home. Cleans easily with a light rinsing of soap and water, for tougher soiling Soft Scrub or SOS pads can be used revealing a new surface as bright as when new. Cigarette burns can be scrubbed away! There is never a need to paint your heavy titanium furniture. Usually ships in 14 days or less. 475 points will be rewarded to you when you buy this item.